Braces have been set up to make sure the walls don’t collapse outward at the northwest corner of Second Avenue and Ferry Street. 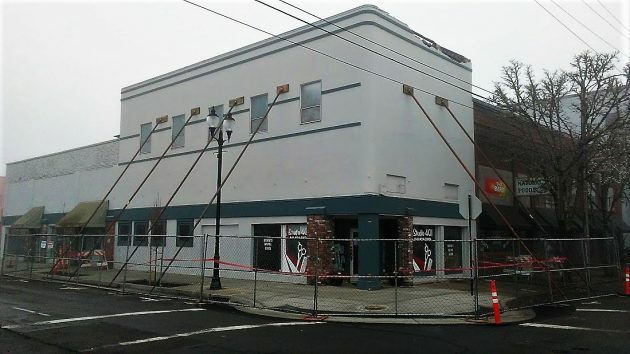 Albany city officials are worried about the stability of a downtown historic building after its roof caved in earlier this month. The walls have been braced, and the owner is said to be working on a plan. On Nov. 7, the hairdressers working in Studio 401, at 401 Second Ave. S.W., told their customers on Facebook that a few days before the roof had crashed to the floor above them. The three women said they had to leave but for the time being their clients could find them at nearby shops. City Manager Peter Troedsson provided an update in his regular Friday report to the city council. There had been a further collapse of the roof and part of the top of a wall. The city had a structural engineer and architect check the walls, and the main concern was for the stability of the east wall, on Ferry. The owner, Troedsson said, was working on a plan to stabilize the walls and take off loose bricks at the top. By Saturday, the walls had been braced on both streets, and the sidewalk was barricaded to keep people from coming to grief if something falls down. Troedsson said Gerding Builders was working with a crane company to remove the debris. The city building official, meanwhile, was requiring people to stay out of the building. Linn County tax records show that Monteith Square, which encompasses several addresses including 401, was sold in April 2017 for $318,500. The owner is listed a Monteith Square LLC. For the history, I checked the Albany Visitors Association’s guide to the city’s historic districts. It says there that one James Dannals started a furniture factory at the address in 1877 after he returned from the California gold fields. Then, Monteith Square was developed in 1929. This, by the way, is the second recent case of structural failure downtown. In September 2016, part of the front wall of the Espolon restaurant on First Avenue collapsed during attempted repairs. The city gave that owner a choice of fixing the building or tearing it down. The wall was shored up, but the structure remains empty. Older isn’t always better. It is not really pretty. I say tear it down. Either way the rent will be too high to make a go of any business in there. While I appreicate historic buildings, and live in an historic home, I agree with Babs on this one. It may be time to take this building down. If the roof has collapsed, that seems a sign of serious neglect and structural issues. Perhaps it is time for an infusion of CARA-KASH. The affected building is downtown. Thanks for the report. Seems odd that this, at least to my recollection, was not mentioned in our “local” newspaper. Guess Albany takes a back seat when it comes to events that occur there. Yes, CARA-KASH should have been put into this building before the collapse! Riiight… CARA can simply barge into any private business and demand to inspect the property simply because it thinks it might have some structural problems. Never going to happen… Building owners do have rights & responsibilities. CARA-KASH…when nothing else will do. Mary, yes Cara made a forgivable loan for part of the Carosel, but the biggest share of it was through donations. In my opinion, it is the most gorgeous building in Albany. Older doesn’t necessarily historically significant. If this is simply an old structure with no significance, why hold the owner to a preservation standard? Having said that, I’ve noted something about Albany and Linn County in my short time here. There’s a rule, regulation, or law on pretty much any subject to enforce uniformity and stifle change.